With only a few weeks left before the return of the oft forgotten Mario bro, it only felt right to throw back to the Gamecube classic, Luigi’s Mansion. I could have dusted off the old Gamecube, but for time I utilized the backwards compatibility of the Wii, and plugged in an old memory card and my wireless gamecube controller. On a sidenote: you should never get rid of old school Nintendo stuff, just in case you get hit with nostalgia. Graphically, don’t expect it to look as good as Mario does on the Wii system or will be on the WiiU, but it holds up quite well for being a title that was released in 2001. The premise of the game is simple, and I found that to be a pretty nice break from the more complex stories and ideas I’ve come to expect from other titles. Mario has gone missing after receiving word that Luigi won a mansion in a contest. Of course, there is nothing right about this. (When’s the last time Luigi won anything with Mario around anyway?) Now Luigi is in search of his brother in an ominous mansion in some spooky woods. Of course spooky woods and creepy mansions aren’t quite enough for the man in green. It just so happens that the mansion is haunted by ghosts. D uring his first encounter with the silly ghouls, he is saved by Professor E. Gadd, who has conveniently converted a vacuum cleaner into his means to catch the pesky ghosts. After a brief intro with the professor, Luigi is now armed with his flashlight, the Poltergeist 3000 vacuum cleaner, and the shaky knees he needs to catch the ghosts that inhabit the mansion and find his brother. Things only get worse upon the release of the classic Mario enemies, the Boos. If you were worried that catching ghosts as the lime green lad would take a while, I’m here to put you at ease. The game isn’t very long. 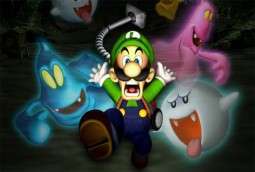 The entire mansion is divided into four areas, each inhabited by different types of ghosts that appear throughout the mansion, as well as more special ghosts in each area that wont startle easily from Luigi’s flashlight. Some of the methods needed to startle the ghost’s are creative, but nothing in the game would be on the level of Legend of Zelda puzzle solving. Once the boo’s are released, there are 50 of them to collect after they scatter through the mansion. If chasing bad guys isn’t the only thing you were hoping for, try collecting as much money as humanly possible in this game, because it’s all over the place. Classic gold coins, dollar bills, gold bars, diamonds, pearls, etc. If you’re good enough you will make Luigi a very happy man by game’s end. The more money you get, lands you a big surprise at the end. On my play through it ended on the side of modesty, so a second play through on the games hidden mansion may change my fortune. Overall, I say this is a game that people shouldn’t have missed the first time around when it was released with the Gamecube. While short the game is enjoyable just for the silliness of catching ghosts as Luigi and collecting as much money as possible. Graphically it handles itself well, though you shouldn’t expect it to look amazing after 12 years. I always loved this game, and I’m honestly looking forward to its sequel! It was a good game! Looking forward to the how it’ll look for the 3DS.